Malmö, May 07, 2014: INOR, the temperature center of excellence within the KROHNE Group, has had major influence on the development of temperature transmitters. Founded 1939 in Malmö, Sweden, INOR celebrates its 75th birthday this year. The company was founded by Austrian Alfred Brakl who emigrated to Sweden in the 1930s. Focussing on temperature assemblies from the beginning, it started as a sales company for temperature assemblies and associated components. In the following years, Brakl expanded by setting up an assembly and matching services for temperature products. Not satisfied with what was available on the market at that time, he decided to develop his own temperature transmitter in the 1960s. From his idea derived a milestone for temperature transmitters: in 1974, INOR introduced the first temperature transmitter that could be built into the connection head. Since then, the design of the head-mounted transmitter has become an industrial standard and helped to extensively promote the name INOR as an innovator. 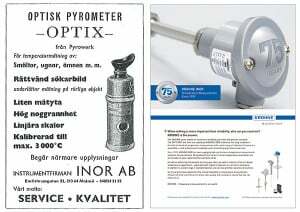 About INOR: INOR, a fully-owned subsidiary of KROHNE, has been designing and producing temperature measurement equipment for 75 years. Located in Malmö, Sweden, INOR is today one of the world’s leading manufacturers of temperature transmitters, specialised in industrial temperature measurement. Download the press release and pictures here.